If nurses in safety gear contracted Ebola, why wouldn't you? How come nurses wearing protective gear can catch Ebola from a patient, but health officials keep saying you almost certainly won't get it from someone sitting next to you on a plane? First, the odds of an Ebola-infected seatmate in the U.S. remain tiny, even after the news that a nurse coming down with the disease flew commercial across the Midwest this week. Then there's the extra screening that's begun on airline passengers arriving from West Africa. People infected with Ebola aren't contagious until they start getting symptoms, such as fever, body aches or stomach pain, research shows. -The Liberian man who died in a Dallas hospital Oct. 8 wasn't ill when he flew to the United States, according to the U.S. Centers for Disease Control and Prevention. So passengers on his United Airlines flights aren't considered at risk. -The nurse who flew Frontier Airlines from Ohio back to Dallas on Monday night wasn't experiencing symptoms, either, the CDC said. But by Tuesday morning she had a fever. Because her temperature rose so soon after traveling, everyone on her flight will be interviewed by health officials, and passengers determined to be potentially at risk will be monitored. CDC Director Tom Frieden says that's for "an extra margin of safety." "We think there is an extremely low likelihood that anyone traveling on this plane would have been exposed," Frieden said Wednesday. He also said the nurse shouldn't have taken a commercial flight because she was among the hospital workers being monitored after potential exposure to the Liberian patient. But what if that guy on the plane is sick? Even if a traveler is already feeling sick, Ebola germs don't spread through the air the way flu does. Ebola is transmitted through direct contact with bodily fluid, such as getting an infected person's blood or vomit into your eyes or through a cut in the skin, experts say. What if a sick person's wet sneeze hits your hand and then you absentmindedly rub your eyes? Could that do it? Asked about such scenarios recently, Frieden allowed that, theoretically, "it would not be impossible" to catch the virus that way. But it's considered highly unlikely. No such case has been documented. "Should you be worried you might have gotten it by sitting next to someone?" he said Wednesday. "The answer to that is no." Frieden said "what actually happens in the real world" -- and he cited four decades of dealing with Ebola in Africa -- is that the disease is spread through much more direct contact with a sick person. The World Health Organization says the same thing, and notes that few studies have found Ebola in an infected person's saliva, generally in patients who were severely ill. Still, the CDC identifies someone who spends a prolonged period within 3 feet of a person who is sick with Ebola as a "contact" who should be watched for signs of catching it for 21 days, just in case. Pity the poor guy who's prone to air sickness -- will other fliers suspect it's Ebola? 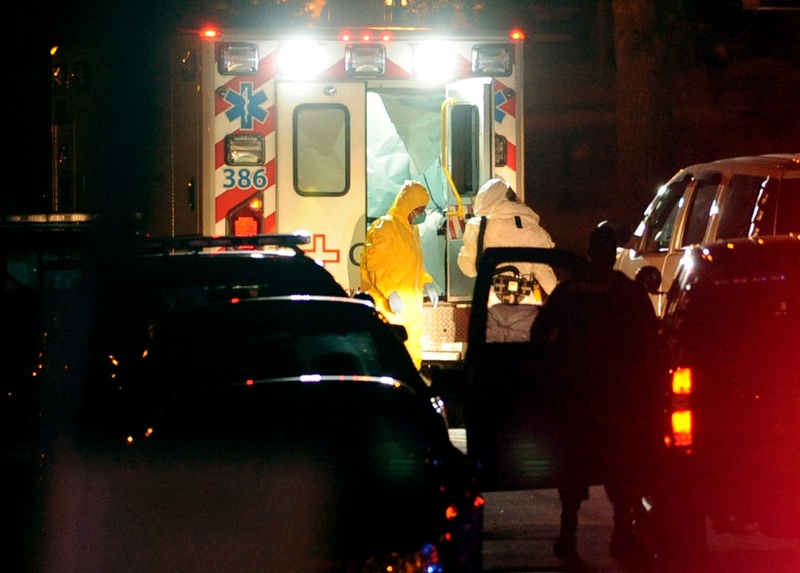 As Ebola patients get sicker, they become more and more infectious. The amount of virus in their bodily fluids climbs, and the disease progresses to projectile vomiting and extreme diarrhea, and sometimes bleeding. All the while, hospital workers are drawing blood, inserting IVs, changing diapers, wiping up. Doctors, nurses and family caretakers have suffered an especially heavy toll in the West African nations where Ebola is spreading out of control, and where there isn't enough protective equipment or help. So far, the three people in this outbreak known to have caught Ebola outside of West Africa -- two in Dallas and one in Spain -- all are hospital workers. All three tended fatal Ebola cases, in hospitals where health care workers were supposed to be safeguarded by their protective equipment. Putting on a gown, gloves, hospital mask and clear face shield might not sound that hard. But once the equipment is contaminated, the steps for carefully removing each piece without infecting yourself are painstaking. It's easy to slip up. Spain's health authorities suspect the assistant nurse in Madrid was infected after touching her gloved hand to her face while taking off her gear. U.S. officials are still investigating what went wrong in Dallas. Frieden acknowledged that the CDC did too little to help the hospital train and protect its staff when they were confronted with the first Ebola case diagnosed in the U.S.
Who's most at risk now? More than 70 other workers who might have been exposed while treating the Liberian patient, Thomas Eric Duncan, at Texas Health Presbyterian are being monitored for symptoms of Ebola. Meanwhile, Frieden offers optimism about the people in Dallas who interacted freely with Duncan before he was hospitalized. There are 48 people being watched because of their potential exposure, including the family he was staying with when he got sick. They have passed symptom-free through the time period when infected people most often come down with the illness. As they approach the ends of their various 21-day incubation periods, Frieden said, "it's decreasingly likely any will develop Ebola."